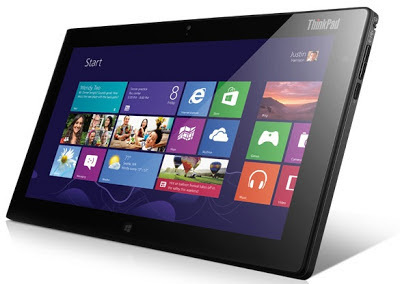 Lenovo on the leading laptop manufacturer, launches its second Lenovo ThinkPad Tablet, called Lenovo ThinkPad Tablet 2, powered by an dual core atom processor that is usually found in netbooks. Lenovo ThinkPad Tablet 2 doesn't rely on Android OS software, instead its running on Windows 8 Pro operating systems, making it an ideal tablet PC, its almost a full pledge PC since it can run windows type application, playing DOTA and any other game is not much of a problem, only its lacking keyboard and mouse, anyway you're not gonna buy this for that purpose. Lenovo ThinkPad Tablet 2 has 10.1 inch display in HD, so watching videos and playing casual games pictures are crisp clear, Lenovo ThinkPad Tablet 2 has a camera of 8 megapixel with led flash, and 2MP 720p HD front facing camera, ideal for your video call needs like skype and Facebook video calls, the weight of this tablet is just 600grams almost like carrying 1/2 kilo of rice, weightless for that matter. Lenovo ThinkPad Tablet 2 will be sold for Php37,990 (SRP), its a little expensive though, but this is Lenovo brand, its make and build will make Php37,990 worth to buy. Lenovo ThinkPad Tablet 2 is now available in the Philippines. The main goal of Lenovo Philippines is a wide range of support from their IT experts. ThinkPad Tablet 2 feature advanced software like Lenovo Cloud Storage, and offer companies and IT managers the support they need to secure and manage company data seamlessly,” said Vicky Agorrilla, Country General Manager, Lenovo Philippines.